The first governor, or at that time called the president of Delaware, was a Presbyterian physician in Wilmington, Delaware. 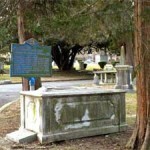 Born on February 21, 1721 in Ulster, Northern Ireland, John McKinly came to Delaware in 1742. While his education and particularly his medical background is hard to trace, nonetheless he soon became a popular physician in Wilmington. Marrying Jane Richardson, they both became prominent members of the Presbyterian Church. He served any number of city, county and state offices, until he was elected by the General Assembly to become the first governor of the Delaware colony. The fact that he was from Ulster, and thus a Scot-Irish Presbyterian, made him acceptable to the Presbyterians from New Castle County. 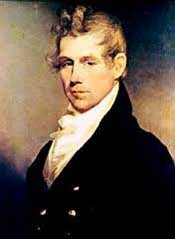 However, the fact that he was a moderate and not entirely in favor of independence from Great Britain, made him popular with the Anglicans from Kent and Sussex County in Delaware. This background, while a good compromise in political circles, did not save him from being captured by the British after the Battle of Brandywine. He would be a prisoner of war until 1778, when he was exchanged for the royalist son of Benjamin Franklin. After that experience, even with promises of support, he never entered politics again. He died August 31,1796, and was buried in the Presbyterian cemetery. 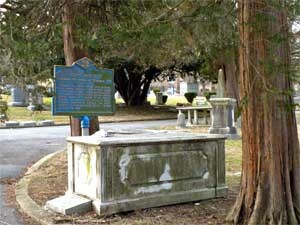 ‹ Governor McKinly’s gravesite, in the Brandywine cemetery. Words to live by: The only reference we have to him being a Presbyterian is the statement that he was “a prominent Presbyterian.” That can mean almost anything and have very little to do with his spiritual testimony. Usually, in those days, a person couldn’t be buried in the Presbyterian cemetery unless they were members in good standing in a Presbyterian church. And people who joined the membership of a Presbyterian church in colonial times had to have a credible profession of faith in Jesus Christ coupled with a credible profession of faith by their works. So arguing from the latter to the former, we can hope at least that his was a genuine faith with a conviction of Presbyterian doctrine, government, and life. WLC 185 — “How are we to pray? This contributor has been involved in several church plants himself as well as participating in Presbytery church planting efforts in the Presbyterian Church in America. So when a mission church, or for that matter, an organized church begins anew in a new building, there can be no better beginning service than that of a prayer meeting. And yet that is exactly what happened in West Chester, Pennsylvania on August 29, 1956. Moving into a new structure for their smaller congregation, the first service was a prayer meeting. And to be sure, united prayer before the Sovereign God was needed for that Pennsylvania congregation. For that very same year, the national denomination of the Bible Presbyterian Church had a sizeable schism which could very easily have weakened what God’s Spirit had already been accomplished in this city and church. But God was faithful in giving wisdom to the congregation, enabling them to stay independent of the whole issue for a while. The church had begun in 1938 as a core group of faithful and committed Christians left the Presbyterian Church, U.S.A. over the apostasy in that once great church. Beginning with just a nucleus of Christians, they were able to begin a church role of thirteen members, with help from pulpit supplies from Faith Theological Seminary. They began as the Independent Church of West Chester. One year later, they affiliated with the Bible Presbyterian Church. Faithful pastors proclaimed the whole counsel of God and the church grew. Evangelistic outreach was begun in the town, and people began to respond to the gospel. Eventually, they affiliated with the Evangelical Presbyterian Church, which became the Reformed Presbyterian Church, Evangelical Synod. Since 1982, they became a congregation of the Presbyterian Church in America. Their allegiance to the Bible as God’s Word, inspired, inerrant, and infallible, remains the same since they began as a local church of Jesus Christ. Words to live by: There is a slogan which American business have often used, sometimes even painted on the shell of a building, which said, “Build it, and they will come.” That probably isn’t always the case, so it is more of a hope than anything else. But in the framework of God’s church, with the faithful proclamation of the Scriptures, the everlasting gospel, coupled with the sovereign God, it is true, as this local church in West Chester Pennsylvania has experienced in the almost 75 years of its witness. Praise God for faithful churches, true to the faith once delivered unto the saints. WLC 184 — “For what things are we to pray? Presbyterians must have still been on vacation during the latter days of August as there is very little national Presbyterian history recorded on these last days, including today August 28! So following up our recent post in the Westminster Shorter Catechism, we look at another catechism which really goes along with it, namely, question and answer number 40. It reads, “What did God at first reveal to man for the rule of his obedience?” And the answer reads, “The rule which God at first revealed to man for his obedience, was the moral law.” The next answer in the Catechism tells us that this moral law is summarily comprehended in the ten commandments. The moral law, definition wise, is the declaration of the will of God to mankind, directing and binding every to personal, perfect, and perpetual conformity and obedience. (See Larger Catechism no. 93) As such, it applies to every part of our being, body and soul. It instructs us to perform duties of holiness to God and righteousness toward man, especially those of the house of faith. Now it is easy for us — for you and for me — to glibly say those words in the above paragraph. And yet, we immediately understand that it is utterly impossible for us to fulfil this moral law personally, perfectly, and perpetually. If anything, this law immediately convicts us of our sinfulness. And yet it clearly reveals the person and work of the Lord Jesus who kept this law personally, perfectly, and perpetually. It was this which was imputed to us, even as our sinfulness was imputed to Jesus on the cross of Calvary. We then seek to conform our lives to this moral law, not to gain salvation, but rather with a thankful spirit to all He has done for us. Words to live by: The moral law is summarized up for us in Exodus 10:1 – 17. Choose any faithful Bible version you wish, and make it your aim to memorize the Ten Commandments, or review them from memory if you have done so before. All Christians should have on their hearts and tongues an understanding of the moral law of God. 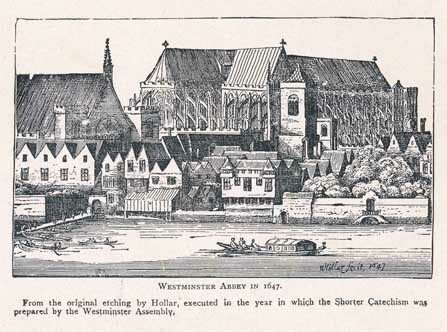 When it was adopted by the Parliament in England, it then went to the General Assembly of the Church of Scotland, where it was adopted without amendment on August 29, 1647. It then became the summary of the teachings of the Old and New Testaments which was adopted by both the teaching and ruling elders, as well as the diaconate in each local church, in every Presbyterian and Reformed church deriving from that tradition. Small changes have been made by conservative Presbyterian bodies in our United States which do not affect the overall doctrinal contents of the Confession. The majority of those changes were made in 1789. You can ask your pastor for more information about those changes. There have been movements all down through church history which have tried to outlaw the idea and even the word of “duty.” Somehow, we should eschew the concept of duty and replace it with the word and concept of “love.” And in one sense, there is nothing wrong with that in that all of us who confess the name of Jesus Christ as Lord and Savior do evidence that saving faith by loving to do what He requires. In fact, because we love Him, we recognize our requirement or our duty to obey what He has revealed for us in Holy Scripture. We owe obedience to God, because of Who He is. He is our Creator. As His creatures, we are under an obligation to worship and serve Him. But with a higher obligation of being His spiritual sons and daughters by being bought with a price, even His precious blood, we are required to worship and serve Him. The matter of that obedience is His revealed will. Moses in Deuteronomy 29:29 says that “the secret things belong to the LORD our God, but the things He has revealed belong” to us and our families. (NASB) “Secret things” are questions filled with “Why did God do this or why didn’t God do that?”. The “why” questions can only be answered by three persons — God the Father, God the Son, and God the Holy Spirit. Our finite minds don’t have the wisdom of the Infinite. We can only trust our heavenly Father to do His sovereign will, and causing everything to work together for good. The things He has revealed are found in the Bible. God requires obedience for those things. John said in 1 John 5:3 “For this is the love of God, that we keep His commandments; and His commandments are not burdensome.” (NASB) They are not irksome, oppressive, or grievous. And 1 John 2:3, “By this we know that we have come to know Him, if we keep His commandments.” (NASB) Obedience is a mark of the believer. It is an evidence that we are born of Him. Words to live by: Obedience to God’s revealed will. There is our path of blessing. Here is our rule of life. To fulfil it, first, we must know God’s revealed will. This is the reason why a Scripture passage is part and parcel of this historical devotional. As we know God’s Word, we then can obey it. Second, we pray that God would build us up in the most holy faith so that we can have the spiritual strength for obedience. Last, we pray for obedience to God’s revealed will on the part of our families, our church family, and our nation. WLC 182 — “How does the Spirit help us to pray? Through the Standards: The reason we are to pray in Christ’s name. WLC 181 — “Why are we to pray in the name of Christ? In what was called a “refuge camp” across the border, Presbyterian and Reformed evangelicals met on August 24, 2011 in Minneapolis, Minnesota to discuss what could be done in the light of the General Assembly and subsequent presbyteries voting in the majority to allow homosexuals full participation in the clergy ranks of the Presbyterian Church in the United States of America. This was no small gathering. It was composed of 2000 individuals, from 49 states, representing 830 congregations of the PCUSA, with 70 middle governmental and denominations officials present. Sponsored by the Presbyterians for Renewal, it introduced the newly formed Fellowship of Presbyterians, which has at its purpose to enable churches to find ways to work within or leave the parent denomination. Within or without! Those two options have several sub-options found in them, but there is still the hope that somehow they might be permitted to work within the camp of the PCUSA. Indeed, the options presented to the delegates included three positions to work within the PCUSA. Yet two of these would require constitutional changes to the Form of Government which would allow either conservative presbyteries within an existing presbytery, sort of a church within a church idea, or the election of two committees to examine candidates for the ministry in each presbytery. These were all the “within” options. It was only the last option which suggested the possibility of separation from the church altogether and affiliation with a New Reformed Body, whatever form that new body would encompass. Other bodies, which have already declared their separation from the UPUSA, such as the New Wineskin churches are planning meetings to reach out to the group which met in Minneapolis in August 2011. All agreed something had to be done. The tent which was supposed to let everyone in had just collapsed in the middle. By the time this historical essay is presented in 2012, hopefully there will be a clearer idea of where the evangelicals left in the apostate denomination will go. Words to live by: It seems to this contributor that the lines in the sand have been moved again and again by the evangelicals in this liberal Presbyterian denomination. All the arguments that by staying in, we can influence the liberal churchmen for good have failed to take in the truth that the liberal philosophy of the modernists can likewise weaken the evangelical and Reformed standards. And yet it can most decided do that, and has done that. There are denominations true to the Scriptures, the Reformed Faith, and the Great Commission of the gospel. Support them by your support, and return to your biblical foundations as a church. WLC 180 — “What is it to pray in the name of Christ? The entire service of Communion that Sabbath day on August 23, 1752 lasted nine hours. But for some two hundred and fifty Covenanters gathered on that spot, it was the first communion outside the British Isles. The teaching elder on that Lord’s Day was the Rev. John Cuthbertson, who was the first Reformed Presbyterian minister in the colonies. As the only one, he had logged nearly 70,000 miles in the wilds of Colonial America, ministering to scattered Covenanters. Often, there was no church building. So they worshiped at various sites called “tents.” It consisted of a large tree, with a wooden stand for the minister, and another for a Bible, with rough pews for the people, and nothing but the open sky for the roof. On this occasion, they met at the Junkin Tent, just north of present day New Kingstown, Pennsylvania. The communion at this first meeting in America lasted five days, with worship times on three of the five days. The first day, which was Thursday, was a day of fasting, with a sermon by Rev. Cuthbertson. Tokens of admission were given to those qualified spiritually to partake, after an exhortation for that purpose. Prospective members were examined and received into the congregation. On Friday and Saturday, no public worship was conducted. In the services on the Sabbath, Rev. Cuthbertson paraphrased the 15th Psalm and preached from John 3:35: “The Father loveth the Son, and hath given all things in his hand.” After the sermon, there was prayer and singing from the psalter. Then the pastor spoke again about the sacrament, debarring some from the table while inviting others to the table of the Lord. The communicants came, singing the Twenty-fourth Psalm, to sit at four tables as was the custom, to receive the elements of the sacred supper. After the table services were concluded, he exhorted the communicants and led in prayer. A part of the 103rd Psalm was sung. Then after an interval of thirty minutes, another sermon was preached. The entire service of that Communion day worship lasted nine hours. Before the worshipers started home on Monday, another sermon was proclaimed as a departing reminder from the Word of God. Words to live by: We might well wonder whether God’s people today would sit through such protracted services. As one minister commented, there would not be many left but the preacher, and most probably he too would feel like departing! But let it be said that these early American Christians did not have all the privileges of weekly services nor access to countless Christian books and media outlets. What they had, they treasured, and exhibited a spiritual fervor which, with all our spiritual privileges, too many professing Christians and churches lack that same spiritual fervor. WLC 179 — “Are we to pray unto God only? We have often in this series of Presbyterian highlights through American history taken time to inquire in the Diary of David Brainerd. In the life of this young missionary to the Indians of his day, he reveals much of himself, and us through him, as well as speaks to the things that are primary in our lives. This day is no exception to that rule. In his travels, David Brainerd had experienced some success in reaching the hearts and souls of the various tribes of Indians. Some had responded to the gospel. Others were convicted by the Word of God. There seems to be some “success” in his desires that Christ be found among them, and in them. Yet immediately after this high point in his life, he goes through a real deep valley experience which bring him low. He speaks of it as “sore inward trials,” and how he has lost any confidence that qualified himself to be a missionary to the Indians. He is exceedingly depressed in spirit. He sees that there is too much self-exaltation, spiritual pride, and warmth of temper in him. He is ashamed and guilty before God. He goes through what we might call a “dry period” of Christian experience. But listen to what he writes on the Lord’s day, which is August 22, 1742. In short, he found that the source of joy is found in the Lord his God, and as he was able to rest in Him, all depression and perplexity vanished away as he glorified God and enjoyed Him forever. Words to live by: It was the Psalmist Asaph in Psalm 73 who asked and answered what David Brainerd (and ourselves) was experiencing here. Verse 26 reads, “Whom have I in heaven but You? And besides You, I desire nothing on earth. My flesh and my heart may fail, But God is the strength of my heart and my portion forever.” (NASB) May this text benefit you, dear reader, this day and always. WLC 178 — “What is prayer? WSC 98 — “What is prayer?